NORTHCHURCH, England, April 20th 2015. Ambrit Ltd today unveiled Approve™ — a major new product in the Metrology™ suite for tracking flow meter performance and analysing prove data. All meters need to be proved regularly to ensure that they are operating within specified limits and comply with the Pipeline and Sales Agreements in operation. 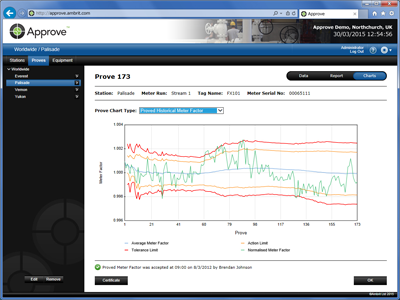 Flow computers perform rudimentary checks on the K factor / meter factor but the API Chapter 4.1 (Metering Systems Hierarchy of Proving Systems) calls for more stringent tests than the flow computer alone can provide. Furthermore, the prove data recorded has often been limited in scope, relying either on the basic prove reports generated by the flow computer or the use of nonstandard, unvalidated spreadsheets. Approve™, developed in conjunction with METCO, is a web-enabled application purpose-designed to manage and verify flow computer generated prove data to ensure that each prove fully complies with the guidelines as defined by API chapter 13.2. It also retains details of every prove from every meter in a centralised database to provide a comprehensive prove history for multiple metering stations. To achieve this, Approve™ runs a series of tests on every prove and presents the outcome as a simple pass or fail; and providing expert advice on the next steps should a prove fail its tests. 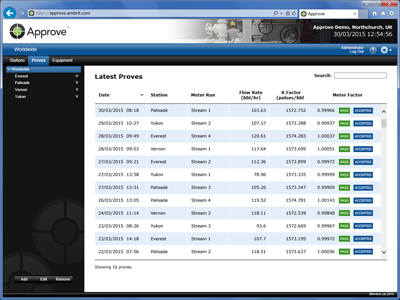 Approve™ helps metering engineers visualise the overall performance of their meters by presenting the historical prove data collected as a series of high quality control charts that clearly demonstrate the results of each prove. This prove data builds up over time to provide a complete picture of the performance of every meter and can be used to quickly identify those meters that need to be re-calibrated or replaced. By storing this data centrally and making it easily accessible to those users who need to be able to view it, Approve™ helps ensure all flow meters are measuring accurately and in accordance with industry best practice; whilst easily demonstrating compliance to auditors and other interested parties. Approve™ is part of Ambrit’s web based Metrology™ suite, a fully integrated set of metering applications that include calibration management, logbook, audit reporting, data acquisition and reporting tools with a centralised equipment tracking database, providing the highest levels of auditability and transparency possible. Please contact Ambrit for more information about Approve™.